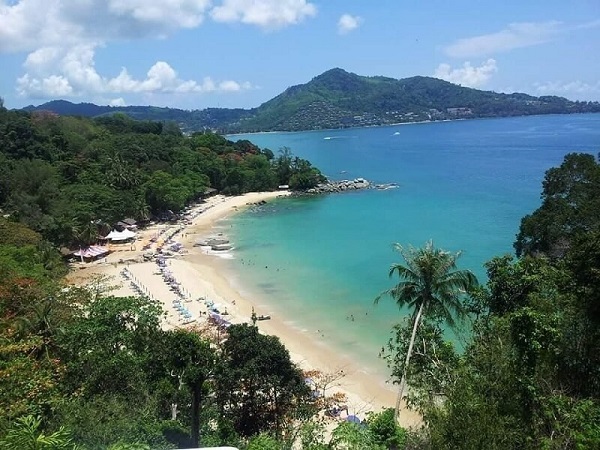 Laem Singh Beach is one of the most beautiful little beaches in Phuket, it is located 20 minutes north of Patong, nestled between Kamala and Surin beaches on the West Coast of Phuket. Laem Singh is a small hidden cape, only 280 meters long with rocky headlands at the northern and southern points. Over the years the secret beach at Laem Singh had become very popular, and a well liked destination for many visitors holidaying in Phuket. 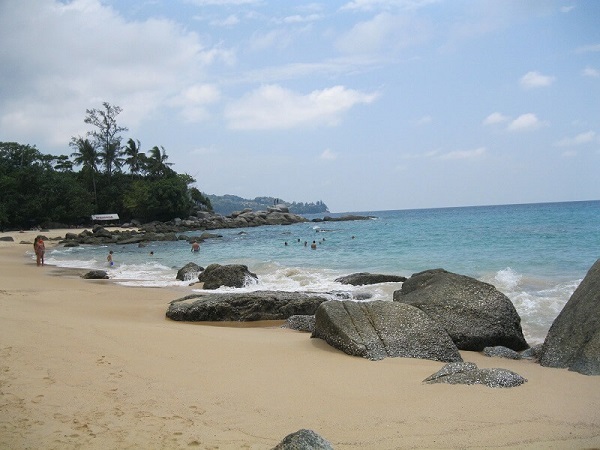 During the high season Laem Singh Beach would be jam packed with tourists. The beach is easily visible from the road and there is great photo opportunities of the beach from Laem Singh Viewpoint. Laem Sing Beach is frequently missed by visitors who are unaware of its location and how to get there. Getting to Laem Singh used to be a five minute walk down a fairly steep path, however direct access to the beach from this path was stopped in 2017 due to a land dispute. You can still access the beach, however you will now have to catch a boat or take a 20 minute walk from the southern end of Surin Beach. The natural setting of Laem Singh is what made this beach so popular and the fact that you haven't got the noise of the tuk-tuks, cars and trucks. 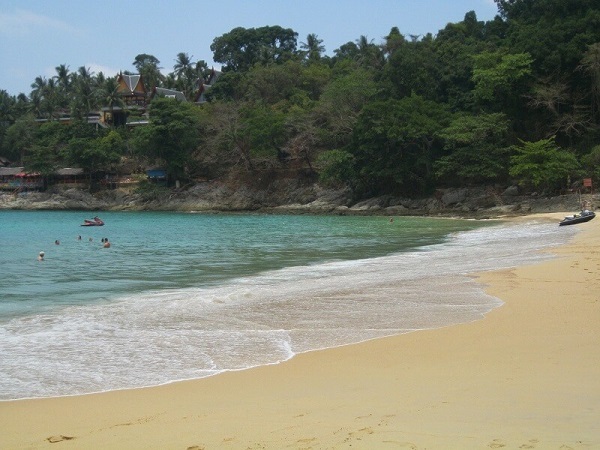 This is a peaceful beach, that is not always felt on some of the more developed beaches in Phuket. Once you are on the beach you will notice interesting rock formations along the beach, if you walk to the southern tip of Laem Singh you can see the Kamala Beach headland. Laem Singh has some of the best snorkelling in Phuket, in particular around the headlands, here you will find beautiful coloured fish. We found the southern end of the beach around the rocks is the best spot for snorkelling. While the northern end of the beach is the best area for swimming and body boarding. Prior to all the changes you could hire kayaks, body boards and snorkelling equipment from the restaurants on the beach, but that has all changed. You will now have to bring your own snorkelling gear. As with a lot of beaches in Phuket, this beach can also have dangerous currents during the monsoon season, so please take care. There is no accommodation directly on the beach at Laem Singh, although there is a range of hotels, resorts and budget hotels located close by. 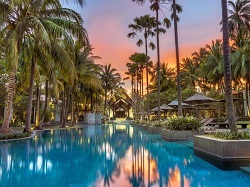 Below is one of our favourite resorts which is located at the nearby Surin Beach. Twinpalms Hotel is a stylish five star resort, located at Surin not far from Laem Singh. There are other hotels and resorts located near Laem Singh beach to choose from, see the full list below. A few years ago Laem Singh Beach was a hive of activity with beach bars and a few good restaurants. There was also the Laem Singh Lounge Bar located on the southern end of the beach that was open from November through to May, where they would hold beach parties called Soundwave Sunday, a popular destination for tourists and expat's, where you could drink and dance the night away. With all the changes this is long gone, but still worth a visit. You have two options to get to Laem Singh beach. The easiest and quickest way is to catch a boat from the southern end of Surin Beach, the boat you are looking for is bright orange in colour and will cost 200 Baht per person for the return trip. The other option is to walk to Laem Singh Beach via a path from the southern end of Surin Beach. The path starts out quiet rocky, so we recommend you wear appropriate footwear. The walk will take around 20 minutes.